Furinno 17072 No-Tools Desk, Espresso is part of the Furinno Turn-N-Tube series furniture. It is designed to be assembled and disassembled easily without any tools. Just follow the instructions by turning and twisting the tubes into the boards. 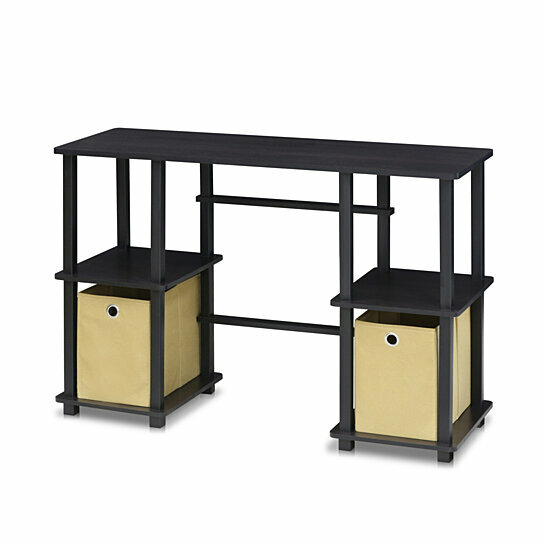 The desk features ample display and storage place as well as 2 non-woven bins to keep things in place. It is made of engineered particle board and PVC tubes tested for durability. The manufacturing process complies with the green rules of production. Assembly is easy with given instructions. A simple attitude towards lifestyle is reflected directly on the design of Furinno Furniture, creating a trend of simply nature. Care instructions: wipe clean with clean damped cloth. Avoid using harsh chemicals. Pictures are for illustration purposes only. Keep things in place with ample storage space. Includes 2 non-woven bins (light brown). Materials: CARB grade particle board and round PVC tubes. Product dimension: 44.49(W) x 29.88(H) x 15.55(D) inches. Product weight: 25.74 lbs.